Every hobby magazine worth the paper its printed on has a "tricks of the trade" type column. 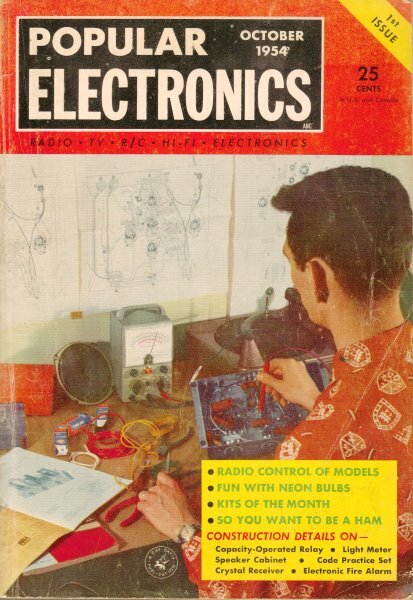 Popular Electronics started out its very first issue in October 1954 with a column that went by exactly that name. For some reason I did not scan and OCR the entire article, but here are the first couple pages of tips. In looking at the other missing page, I'd say nothing really useful was missed, so unless someone specifically requests it, this is all that'll be published. It's good stuff to know, even in 57 years later in 2011. If an outer layer of insulation is used, remove a portion by running a sharp knife around the cable, flexing it slightly to break the insulation loose as shown in (A). Too much pressure on the knife may nick the braid. Loosen the braid with the fingers and push it back so that a flat ring is formed as shown in (B). Using diagonal cutters, clip the outer edges of the flat ring (C) thus separating the braid. Remove the excess braid and strip a portion of the insulation from the inner conductor as shown in (D) . . . . . . . L.G. Bare, tinned copper wire or "bus bar" is often used in commercially-built test equipment. Unfortunately, this bus bar develops kinks and wrinkles if left around the workshop bench and should be straightened before being used in home wiring projects. To straighten any sized bus bar, from 22 gauge to 12 gauge, clamp one end in a heavy bench vise and grasp the other end tightly with a pair of pliers. Now apply a strong, steady pull on the wire. Use plenty of strength, but don't pull too hard or jerk the wire as it may break. The wire will straighten out nicely and may even stretch slightly. If this happens, the wire diameter will be reduced and the wire will tend to be stiffer and hold its shape better. Small diameter shielded cables, such as microphone cable, as well as small sizes of r.f. 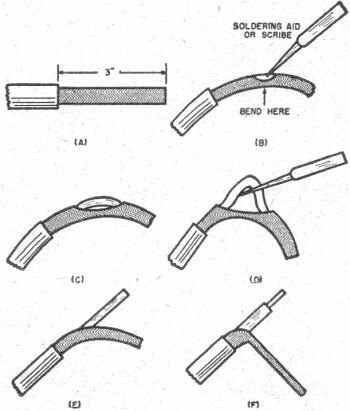 coaxial cable, may be terminated in a professional way by using the method shown in the diagram. If the cable has an outer insulator, remove about 3" of this material as shown in (A) thus exposing the braid. Next, push the braid back to loosen it and bend the cable slightly. With a soldering aid, a scribe, or a small nail start working the strands of the braid apart to form a small hole as shown in (B). Keep working on the opening and bending the cable until you can get the tool under the inner conductor (C). Now slip your tool under the inner conductor and pull the free end out of the braid (D). Hold the edges of the braid back with the fingernail, if necessary, while performing the operation. With the inner conductor free of the braid, stretch the braid out until the opening is closed tightly around the inner conductor (E). Finally, finish the job by stripping insulation from the inner conductor and flatten the extra length of braid to form a ground strap as shown in (F) L.G. A Self-Tapping screw, suitable for use in aluminum, as well as Bakelite, lucite, polystyrene, and other plastics, may be made in a few minutes from a conventional machine screw. Using a steel machine screw of the desired size and length, run a nut up on the screw, almost to the head, as shown in (A). Next clamp the screw and nut in a vise and taper the end (B) using a flat file. 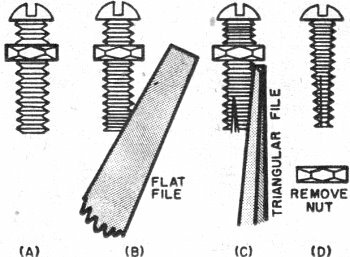 Then, using a triangular file, file three or four tapered notches along the screw. The notches should run the length of the screw as shown in (C) and be deep­est at the end farthest from the head. Finally, remove the nut, as shown in (D), thus restoring any damaged threads L.G. Too-Long machine screws may be shortened by following a few simple steps. First select a steel nut to fit the screw, then run it up on the screw past the part to be cut off. Clamp the screw and nut in a vise, cut off the unwanted portion, using either bolt cutters or a hack saw. Remove sharp burrs with a few passes of the file and then remove the nut. As the nut is run off the screw, the damaged threads will be restored L.G. Aluminum foil is a handy accessory to have in the home workshop for trouble­ shooting chirps and whistles in superhets due to insufficient shielding. Every "new­born" home-constructed superhet receiver seems to have at least a couple of these hard-to-clean-up bugs. Place the set on a sheet of foil and fold up the ends to determine whether shielding the entire chassis will help. Form the foil into temporary tube and coil shields and put barriers of the foil between any components suspected of feedback. This is much faster than the usual procedure of setting up permanent shields and then removing them when they don't seem to help. When components feeding back are found, isolate them entirely with conventional shielding. Always be sure to ground all shields-permanent or temporary. D. McM. Recently I found it necessary to shield a small superheterodyne oscillator coil. Since none small enough for the purpose was on hand, I used the zinc can from a flashlight cell. Simply cut the can with a hacksaw close to the positive end of the cell, grasp the cloth lining with pliers, tear out, and clean the inside of the can. Cut holes for the leads and lugs for screw fastening. Penlight cells make good subminiature shields for portable radios. D. McM.